The Finnish shipping company ESL Shipping Ltd., part of Aspo Plc., and Hamburg based Nauticor GmbH & Co. KG, a 100% subsidiary of The Linde Group, have signed a long-term contract for the supply of Liquefied Natural Gas (LNG) in the port of Oxelösund. The contract contains the provision of the environmental-friendly fuel for the handy size bulk carriers Haaga and Viikki. The vessels are the first of their kind to use LNG and started operations in the Baltic Sea region in October 2018. They are equipped with ice class 1A and, thereby, can operate under the most difficult weather conditions. Predominantly they will be used for the transport of raw materials between various ports in the Baltic Sea and North Sea. Nauticor’s new 7,500 cbm LNG bunker supply vessel “Kairos” will play a crucial role in the development of the tailor-made supply chain for the two vessels. Furthermore, Nauticor will closely cooperate with its sister company AGA operating the Linde Group’s LNG terminal in Nynäshamn, Sweden. “Building up on the experience that we have gained in the development of LNG supply chains for maritime customers in the North Sea and Baltic Sea, we are very happy to support a frontrunner like ESL. 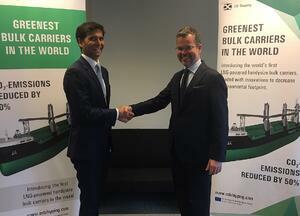 Their initiative to order two LNG-fuelled bulk carriers is another important milestone for making shipping more sustainable in Northwest Europe”, added Mahinde Abeynaike, CEO of Nauticor. Photo: Mahinde Abeynaike, Nauticor and Mikki Koskinen, ESL Shipping. ESL Shipping, part of Aspo Plc., is the leading shipping company transporting dry bulk cargo in the Baltic Sea. ESL secures raw material transportation for steel, energy and chemical industries around the year, even under difficult ice and weather conditions. Special services include topping-off and lightering of large ocean carriers at sea. The company’s fleet consists of 20 units and the annual transport volume amounted to 10.7 million tons in 2016.